If there’s no bread, then eat cake. Some say this diet plan would satisfy everyone’s dreams. But up in space there are many more challenges to consider. Yet, with the potpourri of space farers from across the globe and all their unique culinary tastes, it’s not surprising that space flight excels with special treats. Charles Bourland and Gregory Vogt’s cookbook , The Astronaut’s Cookbook – Tales, Recipes, and More acknowledges this and serves up the directions for many culinary delights. Space-flight challenges are well known. Cramped quarters, lack of fresh air and non-existent cooking equipment turns every normal kitchen duty into a trial. This book shows how NASA rose above these challenges to provide flavour, texture and safety during the many meals that can span a traveler’s repetitive months in space. But, this book is called a cookbook for a reason. Though it provides great detail on the issues regarding food selection, most of the book consists of actual proven recipes. Even with a typical NASA batch constituting hundreds of pounds of material so as to make samples for testing, evaluating and using, this book aims for normal family size servings of about 6 to 10. Delicious sounding treats like Skylab Butter Cookies, Space Shuttle Black Beans and Leroy Chial’s Chinese Cold Peanut Noodles pop out from the pages. Some, as in the later, are attributed directly to a particular astronaut’s desires. Others may be more politically inclined, such as the mentioned Russian borscht (recipe not included). A reader could use the recipes directly as a chance to eat like an astronaut. Even better though, if you’re thinking of an extended camping trip or a vacation well away from fast food restaurants, then these recipes may give you great ideas on what to bring and how to prepare it. Also, you might be helped by the notes on food spoilage and the methods that NASA uses to keep the astronauts fit as fiddles. The emphasis on NASA isn’t surprising as both authors worked there. This confirms the apparent authenticity that continually pops up through the pages with pictures of snacking astronauts, stories about smuggling corn beef sandwiches or trying to get Twinkies across the Soviet border. So even if you’re not planning on going into space or spending months at an analog research station, this book has interesting facts, entertaining recipes and the potential for the beginnings of a wonderful evening. If that’s not enough, the last chapter considers probable astronaut food plans for multi-year flights to Mars and back. With all this, it makes for quite a space themed cookbook. Whether in the mood for non-crumbly cake or long-lasting rye bread, the food’s flavour and variety play a big part in an astronaut’s menu. 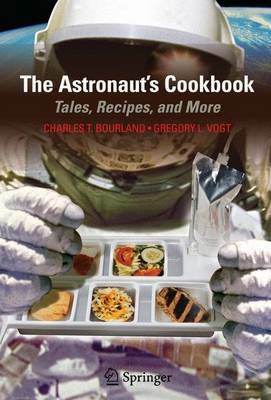 “The Astronaut’s Cookbook – Tales, Recipes, and More“, by Charles Bourland and Gregory Vogt lets you sample the same food that they do and could also prepare you for the long voyage away from readily running water and fresh air. This raises the point that to loft astronauts to Mars you would need to send with them a grocery store’s equivalent of food. Previous PostPrevious Are We Just ‘Lucky’ to See Activity on Enceladus?